Hi. We’re HZ Baltimore. And we love to eat. Like, REALLY love to eat. Last November we demanded Katie Hooper’s husband cook an entire Thanksgiving meal for us—turkey and all. You get it. So, without further adieu, here are our favorite places to dine, drink and gorge ourselves to the point of no return. Only at Stuggy’s can you find the LA Bacon Cheese Dog, the BLT Egg and Cheese Dog, and the locally-appropriate Crab Mac Dog—which, to be honest, all sound disgusting. But once you’re in there you kind of just shrug and say, “Well, I’m already here.” A hot dog topped with pork, pickle chips, and Swiss? Sure. Give it to me. Because you don’t go to Stuggy’s and get a REGULAR hot dog. Chad gets: The Motor City Dog: diced onion, chili, and cheddar cheese. Bad news Katie: It’s not that healthy. They only want you to THINK it’s healthy. That’s their shtick. Their overpriced, gluten-free, dirt in your food, we-grew-it-ourselves shtick. I see right through it. I mean, I’m still getting lunch there, because it’s convenient and I’ve perfected the art of keeping my salad bar creation under $5. But I see right through it. Katie gets: The Mediterranean Salad. Do not be alarmed by the interior. Sticky Rice is, in fact, an Asian-inspired restaurant, not the dive bar it appears to be. Contrary to its name, however, the sushi is not what we come for. The real star? Their tots. That’s right—good, old-fashioned, American tater tots. Order a “side” of tots and you will be presented with an entire box of fried, starchy goodness. Bring friends. Kelly gets: Tater tots, duh. Jon, a man’s man who often boasts about his grilling skills, has a secret. Wait…could it be?! Yes. Yes it could. Jon has a thing for vegan food. 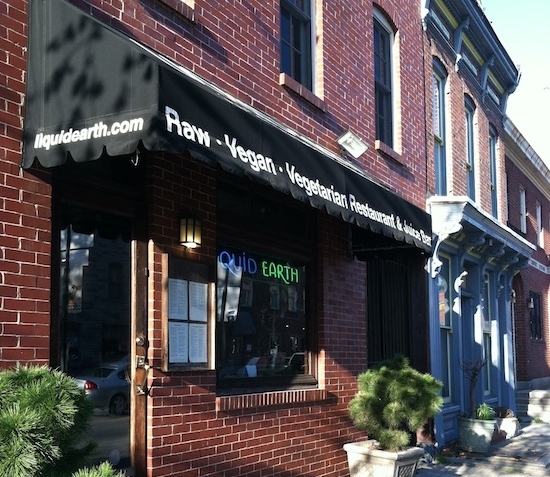 Describing themselves as having an “enlightened eating philosophy,” Liquid Earth serves vegetarian, vegan, raw and living foods, by which I take to mean they serve you squirming squid on a plate, but you’ll have to ask Jon about that. Jon gets: Philly Cheeze Phake with Captain Hempy Juice and a Rawmond Joy. Ra is—you guessed it—the sushi bar out back. It’s not easy to find a table during happy hour, but damn is it worth it. Full disclosure: I’ve straight up sprinted down the alleyway between our building and Ra to make it before 7. Yeah. That good. And…pause. Turns out, HZ Baltimore loves food so much we couldn’t even fit it all into one blog post. To be continued.